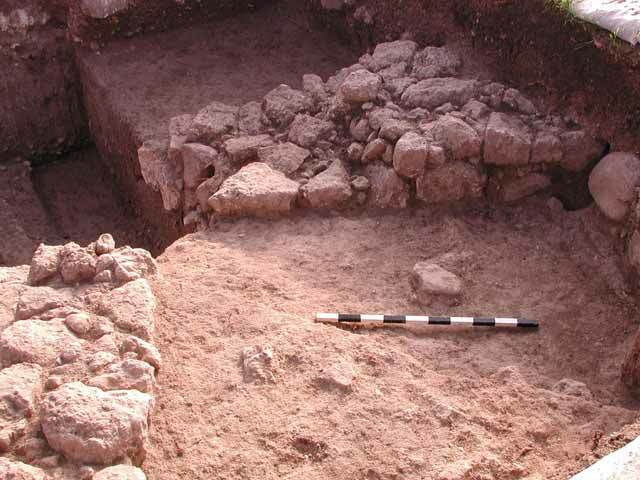 During November–December 2004, a salvage excavation was conducted at Tel Shimron (Permit No. A-4284; map ref. NIG 21965–90/73415–65; OIG 16965–90/23415–65), prior to putting up electric poles along the Bet Zarzir-Nahalal Junction road. The excavation, on behalf of the Antiquities Authority and financed by the Electric Company, was directed by N. Feig, with the assistance of L. Porat (area supervision), H. Lavan (administration), A. Hajian and T. Kornfeld (surveying) and H. Smithline (photography). Tel Shimron is located in the Yizra’el Valley, at the foot of the southwestern end of the Nazareth Range. Running west of the tell is the ancient road, linking Legio to Sepphoris and ‘Akko and passing south of it is the modern road from Haifa to Nazareth. The tell and its surroundings extend over an area of c. 150 dunams. Excavations were conducted on and around the tell in the past (Map of Nahalal , 1982: Site 83; ESI 15:126–127; Wolf and Covello-Paran, pers. comm.). The tell has traditionally been identified with the biblical site of Shimron. Four squares, three extending south to north (A–C) along the shoulder of the Bet Zarzir-Nahalal Junction road and the fourth in the middle of the field, c. 200 m west of Square C, were opened. Square A. Four layers were exposed on top of virgin soil (Fig. 1). Stratum I. Remains of a building (public?) whose exterior wall (W5; width 1.2 m) was oriented northeast–southwest and formed a corner with another wall (Fig. 2). Wall 5 was damaged by a tractor. Its foundations were quite massive and it extended 5.5 m long. Two walls (W4, W6; width 0.7 m) abutted W5 at a right angle from the west. The occupation level that was partially revealed on the eastern side of W4 contained jars and bowls from the Persian period. Parallel to W4 was a well-built water channel (length 3.4 m) that probably extended beneath the floors of the building. Stratum II. A well-tamped white chalk floor, which was cut by the walls of Stratum I and served as a base for the water channel, was exposed. Potsherds from the Early and Middle Bronze Ages were found on the floor. Stratum III. A floor of large pebbles, devoid of any finds, was exposed in the eastern half of the square (Fig. 3). Stratum IV. A layer (thickness c. 5 cm) of small densely packed pebbles, devoid of any finds, was exposed. The two pebble layers (III, IV) point to an alluvial environment in the valley. Square B (Fig. 4). A massive wall of ashlar stones (W202; 6.2 m long) was exposed. It stood a single course high and was oriented northwest–southeast. A layer of small stones bonded with tamped chalk abutted the top of the wall. Numerous potsherds dating to the Hellenistic and Roman periods were recovered from this surface and adjacent to its western side. Wall 202 was probably the remains of the Roman road that linked Legio to Sepphoris. 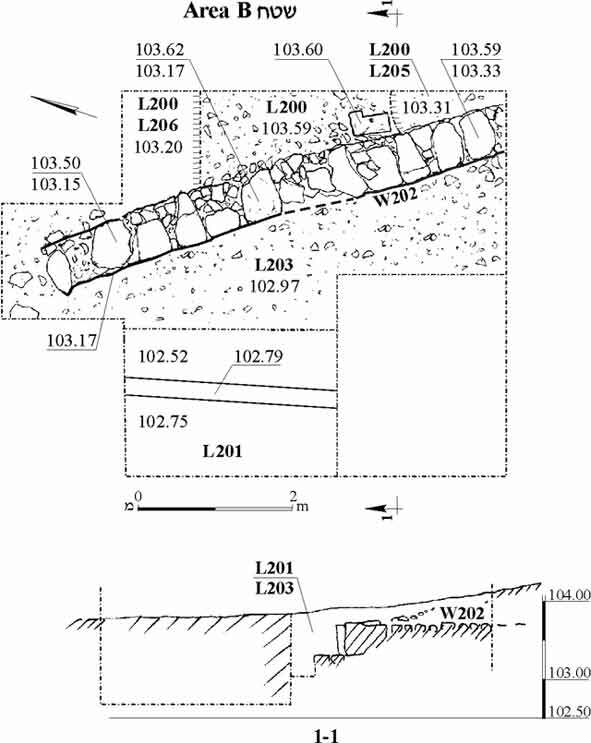 The width of the ‘road’ remains in the excavation square did not exceed 1.2 m. The small dimensions of this section and other modern disturbances made it difficult to date the wall and determine its function. Square C. Three strata were exposed (Fig. 5). Stratum I. A massive wall (W302; 4.4 m long) oriented east–west was exposed in the southeastern part of the square. It was built of roughly hewn ashlar stones whose northern side was coated with a layer of plaster. A well-constructed floor of round pebbles (L363; diam. c. 10 cm) abutted the wall from the south. It did not survive throughout the entire area because it was too close to surface. The meager amount of potsherds made dating the stratum difficult but it should probably be ascribed to the Roman period. Stratum II. On the northwestern side of W302 was a layer of stones (20 × 25 cm), probably fill from the Roman period. Stratum III. 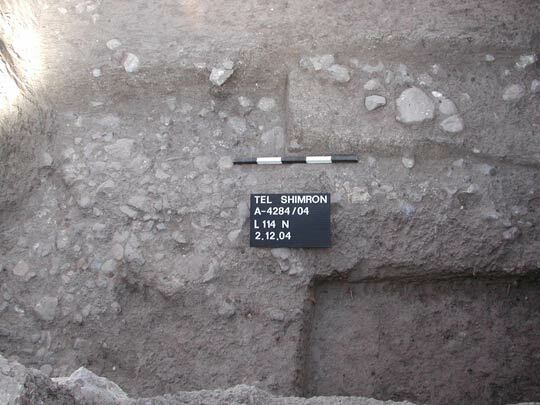 A layer of heavy, natural sterile brown soil that possibly belonged to the alluvium in the valley was exposed on the northeastern side of the square. Square D. A layer of small stones (0.8 × 2.0 m) whose nature is unclear was exposed in the middle of the square, which was not entirely excavated due to danger of collapse. Pottery vessels from the Chalcolithic period, the Early and Middle Bronze Ages and the Roman period were found in the fill overlying the stones. Flint implements were discovered throughout the excavation areas. 1. Square A, plan and sections. 2. Square A, building remains from the Persian period, looking south. 3. Square A, section of Strata III, IV, looking north. 4. Square B, plan and section. 5. Square C, plan and sections.